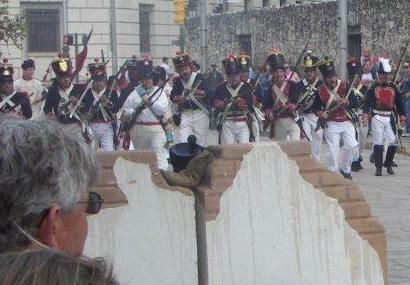 Remember the Alamo, Battle of the Alamo Reenacted. 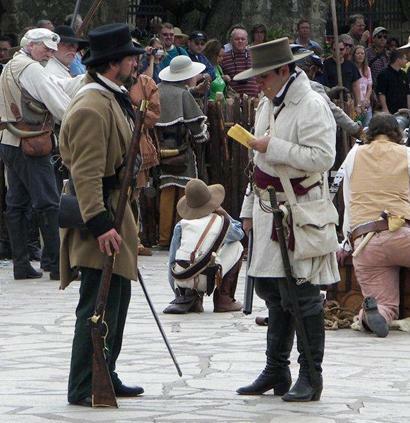 In Late February, 1836, Colonel William B. Travis (at right in white coat) orders all troops and volunteers that are at San Antonio de Béxar into the Alamo compound. 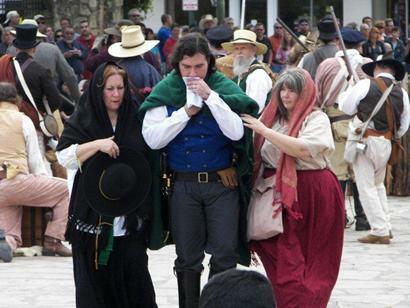 Many women and children are also brought to the Alamo for protection. 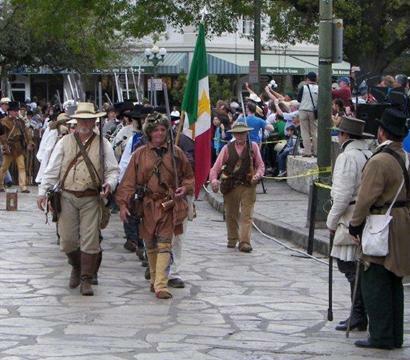 David "Davy" Crockett (right in coonskin cap) leads the men into the Alamo, carrying the flag of Coahuila & Texas, a green, white and red tricolor with two yellow stars in the center white stripe. A courier is sent to the Alamo by Santa Anna, ordering the men to surrender. Travis replies with a cannon shot. On February 24th, Colonel James Bowie falls ill (most likely from advanced tuberculosis.) He addresses his men and urges them to follow Travis. He is escorted inside the Alamo chapel by his sisters-in-law, Gertrudis Navarro and Juana Alsbury. Travis writes his famous letter, addressed to the "people of Texas & all Americans in the world," asking for help to defend the Alamo. After seven days of siege by the Mexican army, Santa Anna sends Travis a letter calling for three days of truce. 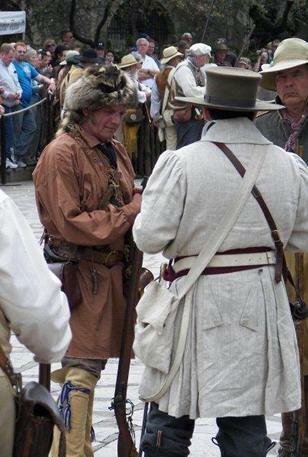 It's at this time that Travis informs the Alamo's non-combatants and volunteers that if they wish to leave, they may do so. 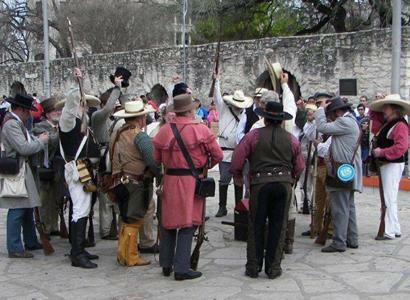 On March 1st, thirty-two troops from Gonzales, led by Lt. George C. Kimbell, receive a warm welcome at the Alamo. March 5, 1836 - After addressing the volunteers, the men decide to stay and fight. At dawn on March the 6th, the final assault on the Alamo begins. 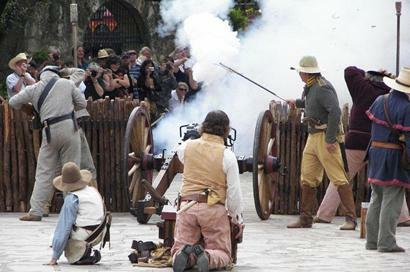 The Mexican troops exploit a weakness along the Alamo's north wall. Shortly after the attack on the north wall begins, Colonel Travis is fatally wounded. 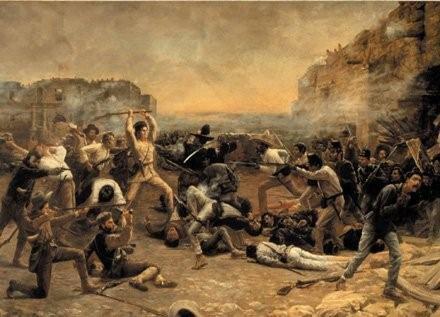 The Alamo defenders engage in bloody hand-to-hand combat as the Mexican troops storm the compound. 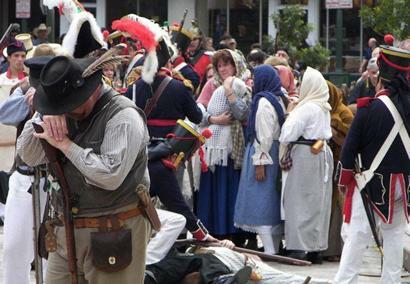 By 8:00 AM, the battle is over and all the Alamo defenders have perished. 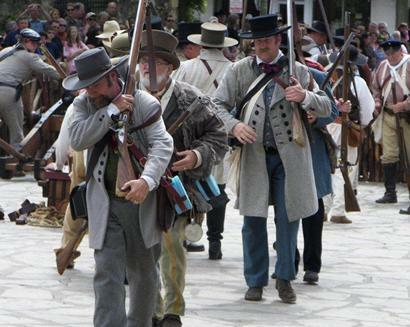 Officially, the number of dead Alamo defenders totals 189, but the actual total may be well over 200. About 600 Mexican troops were killed or wounded. 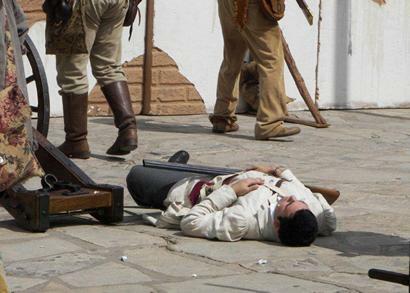 The body on the ground is that of Alamo defender Gregorio Esparza, whose wife and children were inside the chapel and survived the attack. Esparza's brother, Francisco, was granted permission remove his brother's body so that he may have a Christian burial. 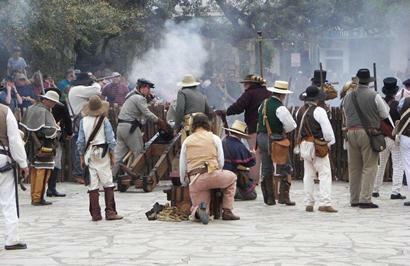 The bodies of the other Alamo defenders were burned on funeral pyres. 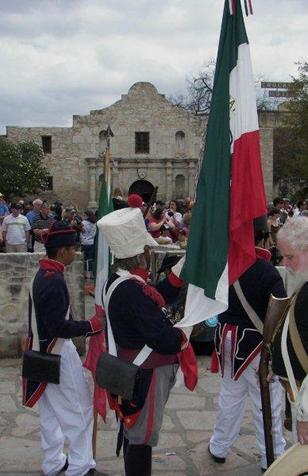 “At 6:00 AM, the Texian and Tejano Alamo defenders, represented by re-enactors dressed in period costumes, entered from the south side of Alamo Plaza while uniformed representatives of the Mexican Army entered from the north side of the plaza led by a man dressed as Santa Anna. I believe the actor may have been an actual descendant. Thirteen women, representing those who survived the battle inside the chapel, entered the plaza and lit candles. Entertainer Phil Collins, who is quite the Alamo buff, read the peace prayer of St. Francis of Assisi in English and another man read the prayer in Spanish. 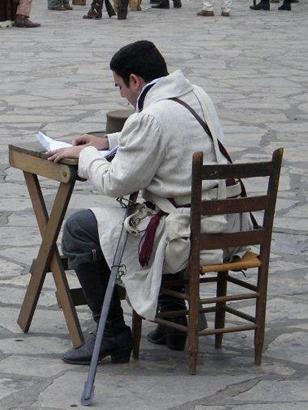 Letters from eyewitness accounts of the battle were also read aloud. 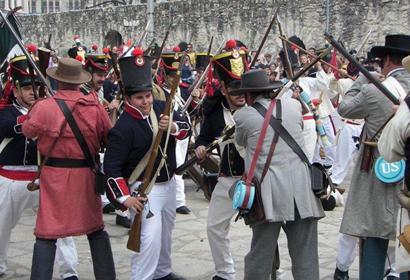 Both groups of soldiers, the Mexican soldiers first, gathered in front of the Alamo and fired their flintlock rifles into the air, the deafening sound causing not a few in the audience to jump backwards. 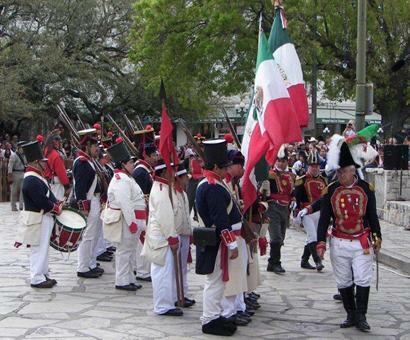 Later, wreaths were placed in front of the Alamo by representatives of the Daughters of the Republic of Texas, the Sons of the Republic of Texas and other groups, including descendants of Alamo defenders such as David Crockett, José Toribio Losoya and Gregorio Esparza. A musician played hymns on the bagpipe during the ceremony, ending with "Amazing Grace." "...Susannah picked up Angelina and followed the officer into the courtyard. It was then that she viewed a site that history books can never describe. The air was still and there was a deafening hush all around. The bodies of the brave dead Texans lay stacked in piles, later to become funeral pyres spreading smoke and history to the sky above..."
"... Mary Millsap, wife of Isaac Millsap, Gonzales Ranger. Isaac was the oldest defender at the Alamo and Mary was now one of the oldest widows. Not only was Mary left with the burden of seven children to raise but she had been blind for many years..."
"...I've also had a desire to get my information from the original sources - that is, those folks who actually lived, loved, fought, and died during those turbulent times of early Texas..."
"By March 5, 1836, Col. William Barrett Travis had known for several days that his situation inside the old Spanish mission called the Alamo had become hopeless..."
"If it hadn't been for her efforts, the Alamo might well have been replaced by a parking lot." The impassioned letters Col. William B. Travis sent by courier from the Alamo are dramatic pieces of writing, but they are not the only surviving words of someone who died in the old Spanish mission on March 6, 1836. An ghost encounter, and chilling tales of ghostly experiences at the Alamo.